Everything goes in the realm of indie games. There's so much to choose from. So much to play. I have a lot of respect for developers these days (don't worry you ol' wolves, I love you too). There's something about these individuals and it has to do with internet and people sharing knowledge with others in a timeless endless vortex of neutrality and reciprocate digital interactions (THANK YOU, user generated content). 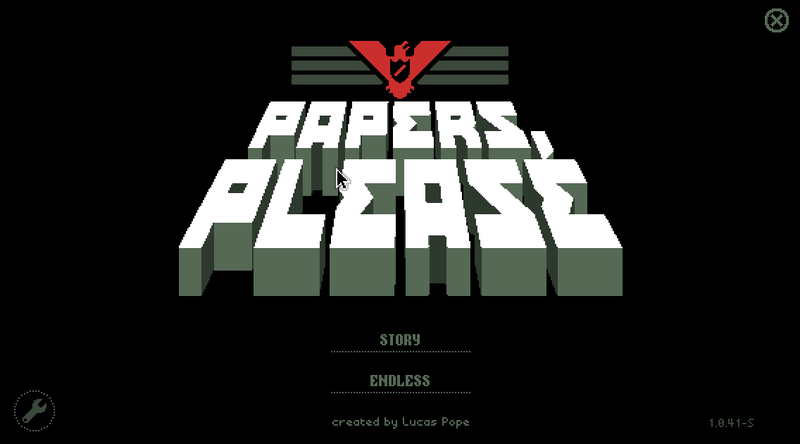 Anyway, I had an amazing (and disturbing) gaming experience last week as I entered the old school looking, dark and enslaving realm of "Papers, Please". It takes place in a fictional country that goes by the name of Arstotzka (I'm actually writing it without looking the name up so if it's incorrect, do tell me. If not, it means the nationalist/your-family-will-die crap they fed me is still in my system... This is an experiment.). 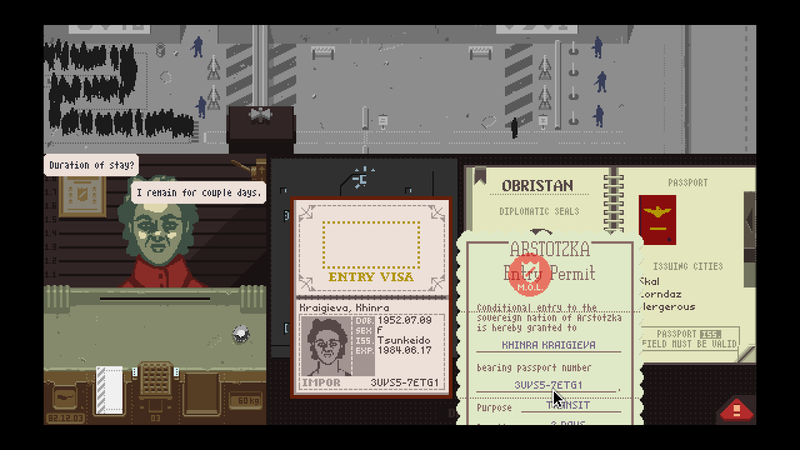 You play the part of an immigration officer in Arstotzka's recently opened border. The goal of the game is simple (or is it? ): Follow the rules and you and your family will be prosperous and proud. Throughout the game, random world events will shape and expand the rulebook by which you'll be playing. Also, you will have to make difficult decisions regarding work, managing your expenses and providing to your family (yeah! just like adulthood). Surprisingly, it can get quite stressful. This is a game for the OCDs out there. You will miss something from time to time. Sometimes you won't even know what it was. You can play this game with various mindsets. The game expects you too. It does have 20 different endings you'll be craving to discover. Sometimes, you might even have to shoot someone. Are you ready for that? The graphics fit into the plot like a glove and the game manages to deliver very well developed characters. All of which play an important role in the story. Even when they don't seem too relevant, all of them feel equally important as the game goes by, 'cause you never know who's the next passerby that will change the game. "Papers". That's one of the few lines you'll be able to discern from the monotone blabbers you can hear in the game. There was a point when I felt sorry for myself. For what I dedicated my life to and how it seemed to be going nowhere. Immersive, check. 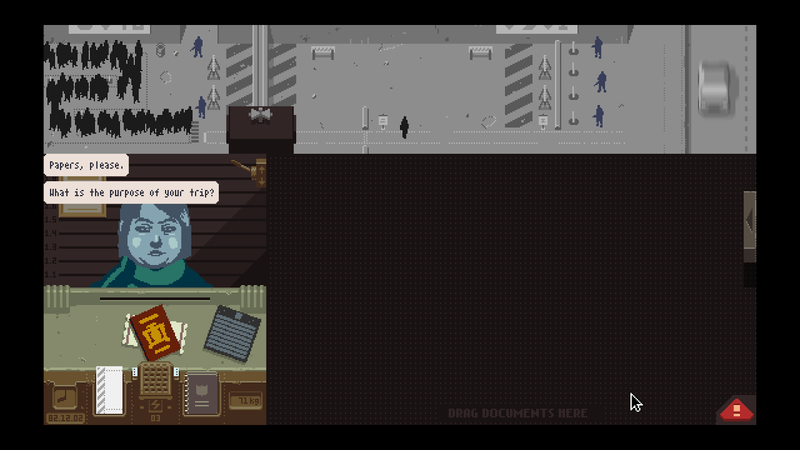 If you have a few hours and dollars to spare and want to play something different, "Papers, Please" is the way to go. It's a game that isn't what it seems. What you see is way less than what you get and the lessons it can teach are rooted in current events, although it's dated a few decades ago. Go tweet some love to the developer of this amazing game, Lucas Pope. Also, visit his website.